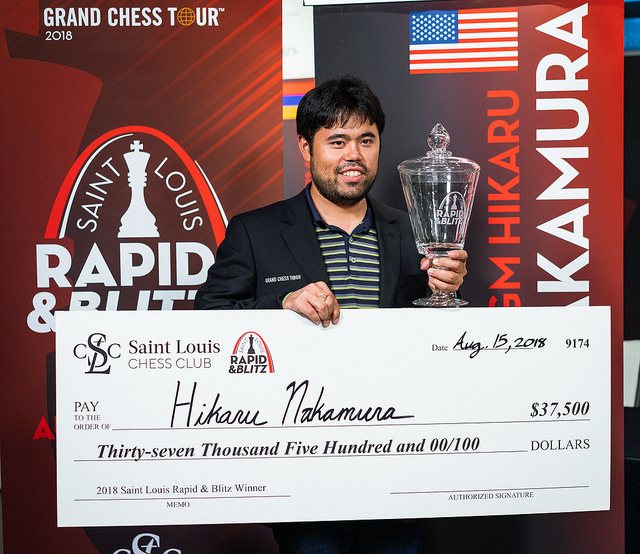 Hikaru Nakamura has followed up victory in Paris by winning the St. Louis Rapid and Blitz and almost guaranteeing himself a place in the Grand Chess Tour final in London. 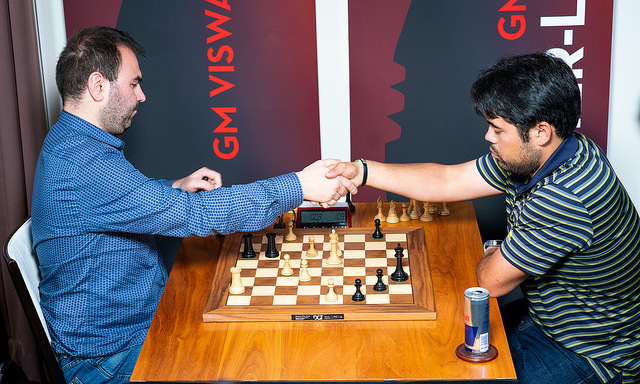 He did it with victory in the penultimate round over Shakhriyar Mamedyarov, after the two players engaged in another neck-and-neck chase. 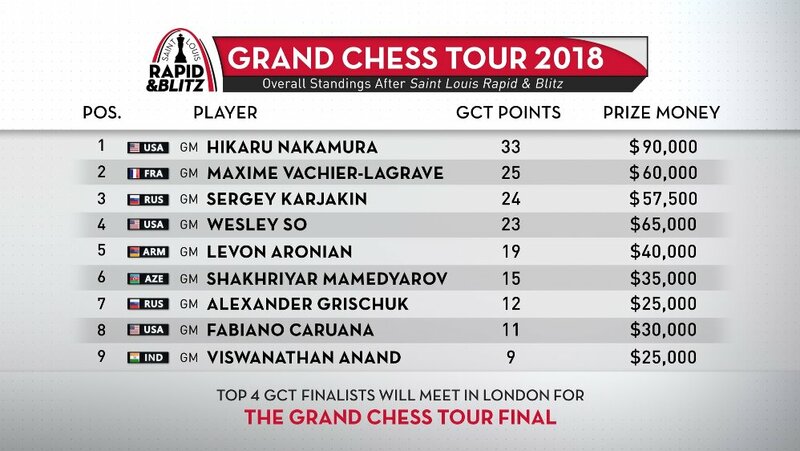 Maxime Vachier-Lagrave remained the blitz top dog, beating both Mamedyarov and Nakamura, but had to settle for 2nd place both in St. Louis and on the live rating list, where he finished just 2.2 points behind Magnus Carlsen. …and also in Russian. If you don’t speak Russian you might still be interested in Peter Svidler’s English interviews with Nakamura and MVL at the end. Unsurprisingly it also turns out Svidler would be a wonderful interpreter! For the first half of the final day the race for the title in St. Louis developed almost exactly as it had a day earlier. 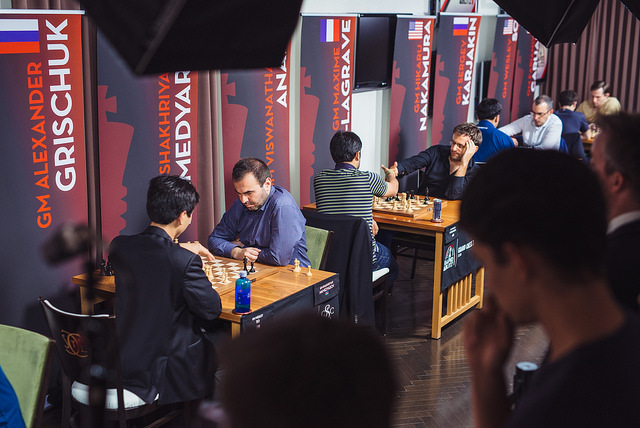 Mamedyarov again took a half-point lead after the opening round as Nakamura lost a second game in a row to Sergey Karjakin, this time getting ground down in the Berlin endgame. Then in the very next round the players were again level, after playing an early g4 (with the black pieces!) for once backfired on Mamedyarov, who went down in flames against Leinier Dominguez. 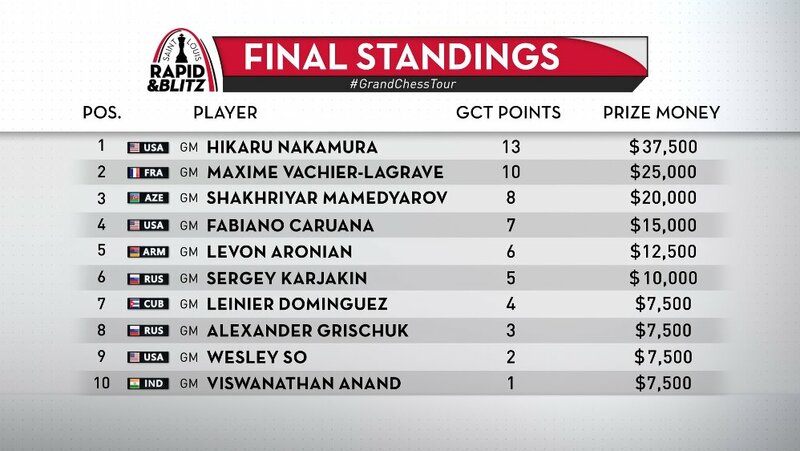 Meanwhile Maxime Vachier-Lagrave was already closing the gap with a 1.5/2 start. 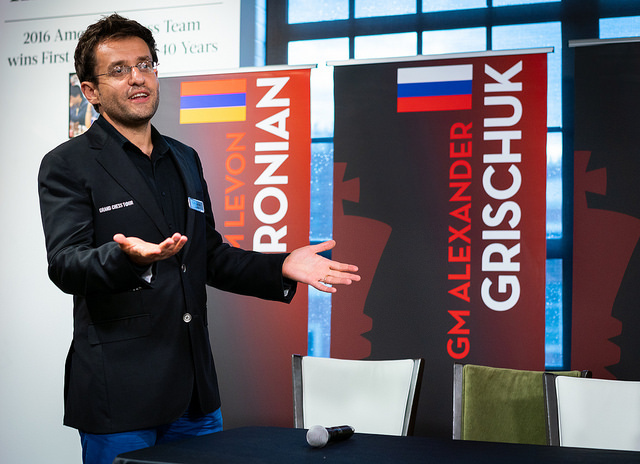 Fabiano Caruana and Levon Aronian would briefly threaten to join the hunt, but it was soon clear it would be a 3-horse race. 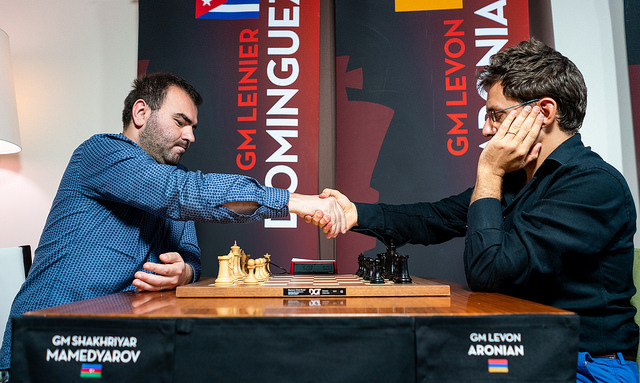 If anyone seemed destined to win the tournament it was Mamedyarov, who pulled off a swindle Levon Aronian would have been proud of, against Aronian himself! Mamedyarov has White and is a pawn up, but here played 32.Nd5?? and dropped the bishop on b2 for no compensation. Perhaps he forgot that, with the bishop gone, after 33.g4 Black could simply play 33...Rc1+ and get out of the potential fork on e7. That should have been game over, but Shak fought on and - though it's not easy to see how even in slow motion – he managed to go on not only to save the game to but to beat Levon. 43.Nb5! is even more painful for Black than it looks at first sight, since the unstoppable Nd6+ fork is accompanied by the threat of Qxh6 (if the king tries to escape) and mate. Fabi had no choice but to resign. The way the game was going at this stage a repetition with 45.Rc4 Qf6 46.Rf4 Qc3 would have looked completely normal, but Hikaru spotted something much better – 45.d4! Suddenly the black queen is cut off from the defence (45…Nxd4 of course runs into 46.Qe5+) and after 45…Kg8 46.Qe5 there was nothing Black could do about a crude attack on his king. Grischuk resigned 5 moves later. I think that game sort of changed everything. I started playing better after that. 22.Nh6+!! is a glorious zwischenzug, with the point getting demonstrated in the game: 22…gxh6? 23.gxh6 and the g3-bishop is pinned to the king along the g-file. After 23…f6 24.Bxf5 exf5 25.Rxg3+ White was a pawn up with a mating attack. 22…Kh8! would have prolonged the game, but at the expense of allowing White the beautiful follow-up 23.Bxg7+! Kxg7 24.Nxf5+ exf5 25.Qxg3. Again, White is material up with a dangerous attack, though the computer claims 25…f4! would have made the rest of the game a contest. You might note that Karjakin had done everything in his power for Mamedyarov’s cause by beating Nakamura twice in blitz (and drawing in rapid) and losing all three games to Shak - the only mini-match of the whole event to finish 4:0! The game continued 27…Be6 (27…Bxc2 just sees Black mated even sooner after 28.exf6+ Kxf6 29.fxg5+) 28.exf6+ Kxf6 29.fxg5+ Kg7 30.g6! and the besieged black king didn’t last much longer. 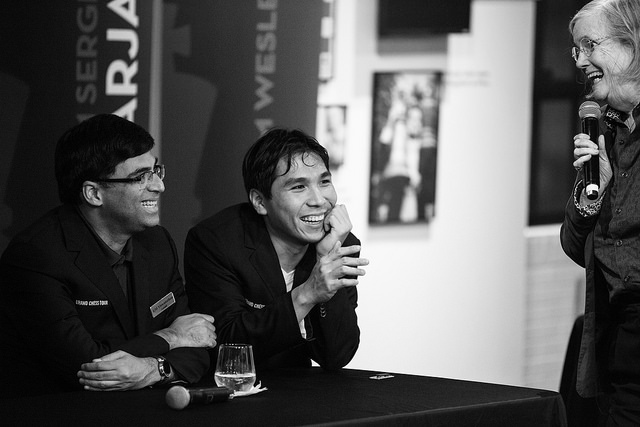 At the same time Nakamura’s countryman Wesley So smoothly won a pawn and eventually the game against Mamedyarov. One moment early on there is perhaps worth mentioning, though, simply because it’s a nice trick! 11…Nb4!! would have brought an abrupt halt to the normal development of the game! It’s hard to even imagine such a move, but if you do it’s simple to see that the knight can’t be taken due to Bc2, trapping the queen. The threat of a knight fork on c2 means play might continue with the awkward 12.Rf1 Bc2 13.Qe1 Nd3 14.Bxd3 Bxd3 and although it turns out White can avoid losing an exchange with 15.Qe5 we’d reach a technical ending where Black had the advantage. 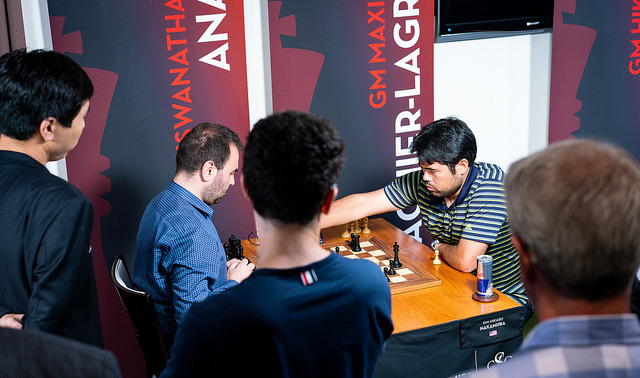 As it was, everything came down to the penultimate round clash between Mamedyarov and Nakamura, an epic struggle that deserves a section of its own. Those games against Shak were a lot of fun. I think out of everyone that I’ve played over the years somehow blitz games against Shak are always the most interesting… and usually the most enjoyable, regardless of the result, because they tend to be very exciting! Another fork in the road, as here the double check 15.Nc7+! was strong. Nakamura wondered what White had after 15…Kf8 16.Bxe5 Rc8, only to be shown the computer’s 17.Qc6! After 15.Bxe5 immediately Black was taking over, but Hikaru would later comment that he “relaxed too much”. White could have played d4 earlier with a solid and promising position, but even at this stage White can still keep an advantage. 42.Be5! would ask Black a lot of questions, since the a-pawn isn’t as vulnerable as it looks – if the b6-rook leaves the 6th rank Bd6+ will win the pawn on c5, while 42…Rb3? would allow White to show off with a winning move like 43.Rxg7! Instead Mamedyarov allowed the bishop to be bullied off the long diagonal with 42.Bc1?! and shortly afterwards a misstep with his king meant the bishop would die in that cage. I thought today for the most part, with the exception of one very bad move in the first game, that I played quite well. I was pretty pleased, unlike yesterday, where I felt that I did not play very well and I was actually quite lucky to score a few points. I’ve played in London every year they’ve held the event, so I think it’s 8 or 9 years in a row. I’ve celebrated my last 9 birthdays there, so I think more than pressure it’s more kind of just wanting to have the familiarity of going back there again in December. It’s quite nice. I do enjoy going to London, and I think if I had to put up a big score in the classical I think it would add a lot of pressure. It doesn’t change much overall, but it is really quite nice to just be able to play the classical as a standard stand-alone tournament. There was still some business left to complete in the final round of the tournament. 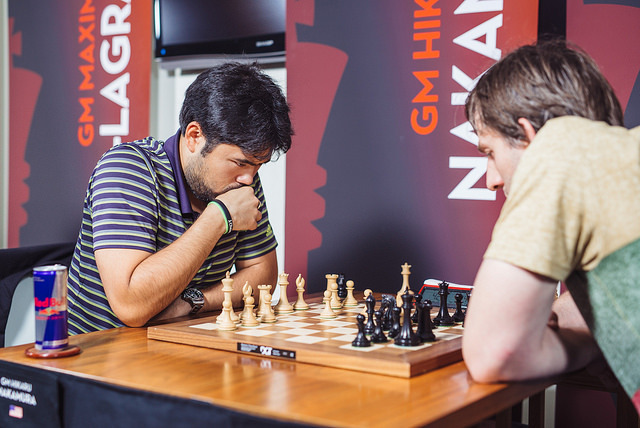 Hikaru Nakamura still had to play one more game of chess, and unfortunately for him it was against a player who had totally dominated the blitz – Maxime Vachier-Lagrave. Sure enough, Maxime went on to grind out one more win, taking his score for the day to 6.5/9, just short of the 7/9 he’d posted on the first day. Maxime wasn’t getting carried away, telling Maurice, “I don’t think I’ve caught up with Magnus in terms of blitz strength, despite what the ratings show”. His explanation for success in the blitz after ruining his rapid score with three losses in a row? In the blitz two things could happen - I could just burn after this rapid, or I could play free from any pressure, and this is also what helped me close the gap on the leaders. 23…Bxa2+? was a fine, thematic sacrifice with the one drawback that in this concrete position it doesn’t work. After 24.Kxa2 b3+ 25.Kb1 a3 26.cxb3 MVL sank into a long think as he realised he had no attack. That meant he was just lost, and Levon smoothly wrapped things up. Aronian deserves a special mention at this point for going the whole day without a single draw. He scored 4 wins and 5 losses, but it’s been a revelation to see him playing 1.e4 and the sharpest lines in this event – will he also make it his weapon of choice in the classical tournament to follow? Svidler: I have to start with the question that everybody badly needs to know – was there any point today where you regretted not wearing the same shirt? MVL: Not really. I mean I kind of wish I would have, but at the same time it went pretty well without. Svidler: It didn’t go badly, but when they showed us the first shots from the hall and I saw you actually wore something sensible I have to say a little bit of me died at that moment, and I will forever blame you for it. Perhaps Maxime can go some way to putting right that wrong in the Ultimate Moves or Sinquefield Cup to follow! 40.Re1! !, offering a whole rook with check, would have been a nice finish. Instead that game ended in a draw. 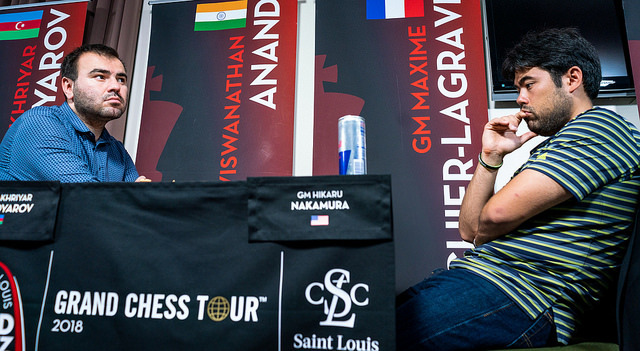 The shocker here is that the leader before the St. Louis Rapid and Blitz, Wesley So, is suddenly facing a fight to qualify for the Grand Chess Tour final in London, after picking up just two points. 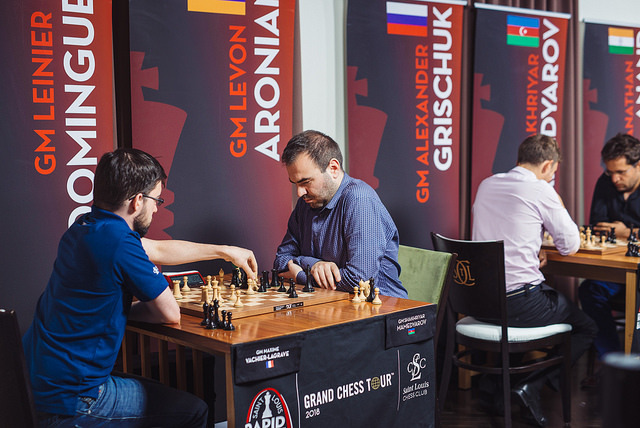 Only the top four players make it, and in contrast to the 13 points for clear first in the rapid and blitz events there are 20 available in the classical Sinquefield Cup. The one player who can rest easy is Hikaru Nakamura, though even in his case it seems it’s not a mathematical certainty. For instance, if he finished last in the Sinquefield Cup with Aronian, So, Karjakin and MVL in clear 1st-4th he would, based on some quick back-of-an-envelope maths, need a playoff to qualify. Every year Garry’s there inevitably someone on either team makes some kind of insane blunder and Garry just has a typical Garry freak-out. Without Garry we might actually see Rex and Randy play significantly better chess. The emphasis, however, will of course be on the trash talk. You can watch all the action live here on chess24!